A possessed hand has a murderous mind of its own. 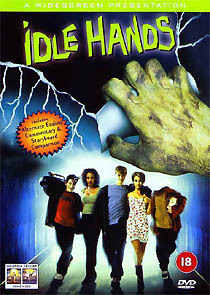 Idle Hands didn’t receive a theatrical release in the UK, but, as if to compensate, has been released by Columbia Tristar on DVD replete with a full brace of extra materials that should elevate its status. The film is basically teen reworking of the Mad Love story. The hand’s owner, though, is a slacker, who’s just as worried that it will ruin his chance of scoring with his next-door neighbour (a sizeable role for Dark Angel's Jessica Alba). The film plays like a souped-up episode of Buffy The Vampire Slayer, with a much darker tone. The DVD contains a funny self-deprecating commentary track (by Rodman Flender, Elden Henson and Seth Green), an alternative ending (substantially different to the one eventually used in the finished film), a six-minute promotional featurette, two scenes presented in split screen with their storyboards and a trailer (the only thing that is different on the US disc). Idle Hands is certainly worth a risk. Rent it first, perhaps, but don’t be surprised if you later decide to buy!